UPDATE: The product has been cancelled and there was no official reason given. Giving fans and collectors a way to commemorate the baseball title winners on cardboard, 2015 Topps World Series Champions is a 40-card factory set honoring the winning team. Every box set features 40 special World Series cards. This includes 25 cards for the key players on the winning team's roster and the remaining 15 cards are used to document the team's run to the title. Additional focus is applied to the LCS MVP and World Series MVP. 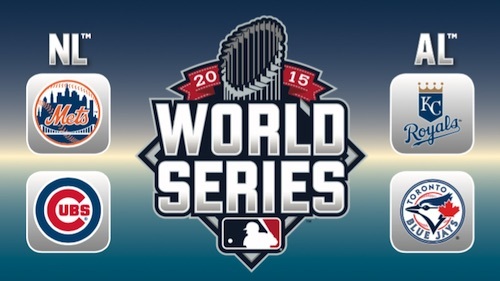 Obviously, the specific team featured in the product won't be decided until the 2015 World Series is complete. Man, this would have been a good idea. They could have used the design for the three flagship sets as a base, but enhanced it in some way. Perhaps with a different color scheme or something.